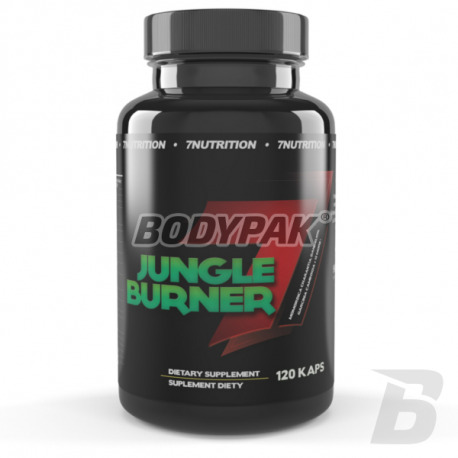 Fat Loss7Nutrition Jungle Burner - 120 kaps. Extremely effective fat burner containing complex components of thermogenic effect. Concentrated formula of 16 synergistic ingredients supports the metabolism and burn fat faster! It does not cause yo-yo effect! 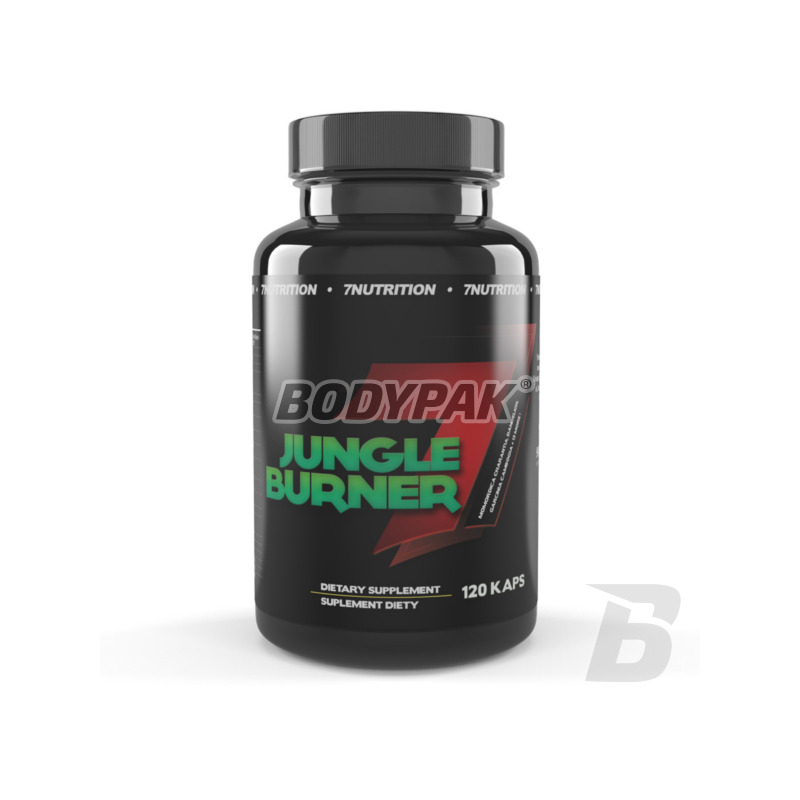 7Nutrition Jungle Burner is an extremely effective fat burner that combines a synergistic effect until 16 active substances! It not without reason, is considered by many to be the best in its category - advanced composition and safety of the stand at the highest level. The substances contained in the preparation have a thermogenic effect, that accelerate metabolism, and thus rapid loss of excess weight! High efficiency is not fraught with yo-yo effect, which is worth emphasizing. Many products with a beautiful label but faint action - in this case is entirely different. Interesting label conceals an effective formula. EFFECTIVE acceleration LOSS extra kilograms. NATURAL EXTRACTS THE HIGHEST QUALITY. 7Nutrition Jungle Burner was created with the aim of working professional who want to quickly improve their form but also about the people who want to lose a few kilos overweight. The product will find a variety of natural plant extracts with specific standaryzacjach active compounds - there is no room for understatements! All substances derived from specially selected sources and are of the highest quality. 7NUTRITION JUNGLE BURNER - change your life! Spożywać 3 kapsułki dziennie, popijając 200ml wody,rano oraz przed treningiem. W dni nie treningowe miedzy posiłkami. Składniki: L-tyrozyna; ekstrakt z Garcinia cambogia 60%; kofeina; ekstrakt z zielonej herbaty; pieprz kajeński; ekstrakt z kory wierzby; ekstrakt z balsamki ogórkowatej; tlenek cynku; ekstrakt z gorzkiej pomarańczy 10%; wyciąg z mniszka lekarskiego; ekstrakt z cynamonu; L-karnityna; resveratrol 50%; substancja przeciwzbrylająca (sole magnezowe kwasów tłuszczowych); wyciąg z czarnego pieprzu (95% piperyny); chlorek chromu III; jodek potasu; żelatynowa otoczka. Nadeszła pora na zrzucenie co nieco. Jungle Burner dobry strzał. Polecam. Jako spalacz w normie, chociaż ja go wykorzystuję jako źródło pobudzenia.